b. Three main types of masonry construction date to the early days of Miami-Dade County: hollow clay tile, concrete block, and oolitic limestone. Hollow clay tile, lighter than concrete block, was used up to the 1920s in large construction projects. Concrete blocks were easily manufactured from local materials. Rusticated concrete blocks, molded to resemble rough-cut stone, were popular prior to 1920 and are still seen in Little Havana. 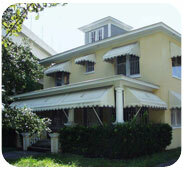 Oolitic limestone is the most typical masonry building material in South Florida and is unique. Quarried in south Miami-Dade County since the mid-nineteenth century, it consists of small rock particles and is used in rubble form. Coral-like keystone from the Florida Keys was popular during the 1930s and 1940s. Masonry Vernacular style commercial buildings, generally two stories in height, feature simple rectilinear plans, parapets and arcades.